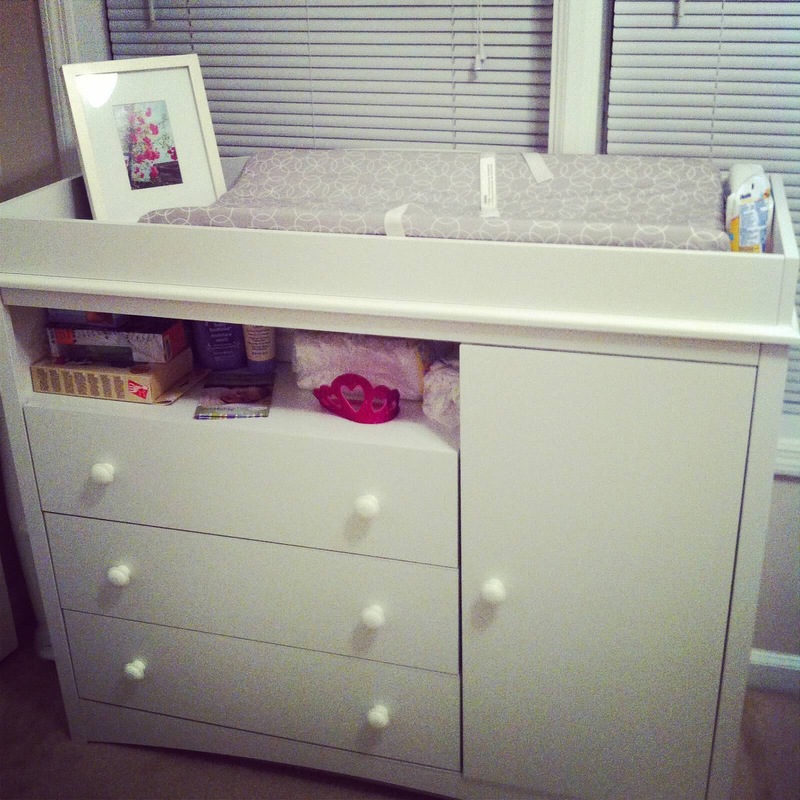 When I first finished setting up Ella’s room, my mom referred to it as her “theater nursery.” Everything was set up to my exact taste and having never had a kid before, I didn’t know how little time Ella would spend in the room initially. 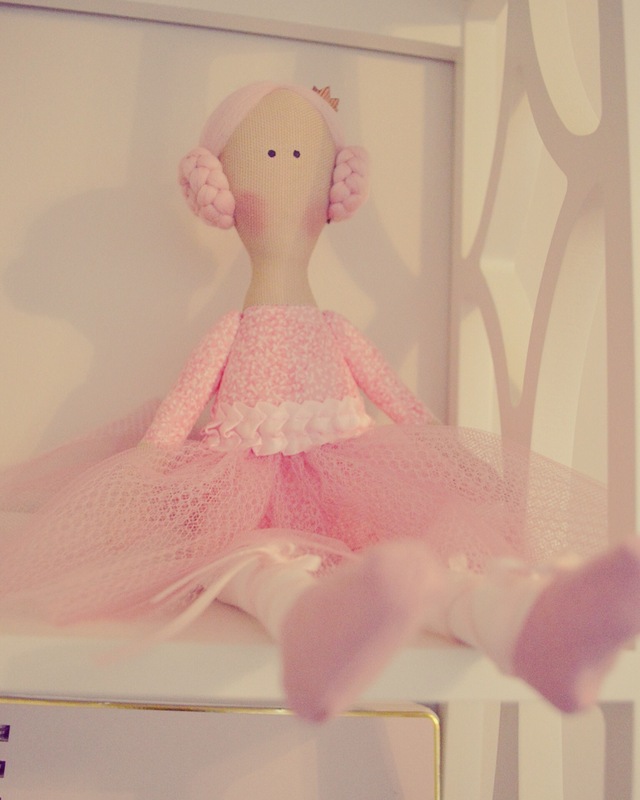 That the little trinkets and pillows and details I had set up everywhere would soon become casualties of war. I mean parenting. 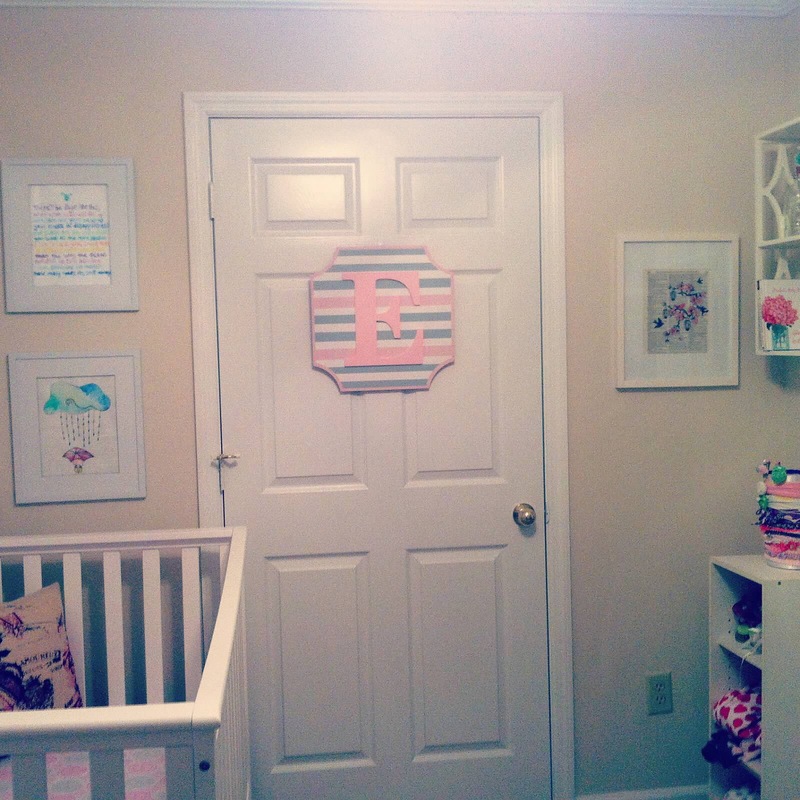 Ella didn’t start sleeping in the nursery until she was 5 or 6 months old because of the poor insulation in the room. She was born in October so it was too cold for her to sleep in so when she was ready to sleep in the crib, we had to move it to the living room. Not the best solution for late night snacking or use of the TV after 8 o’clock. Once it was warm enough for her to use the room, all of the details I’d planned out during my nesting period became, if not entirely impractical, covered in the mess of a mobile child. Now that it’s getting cold again and we’ve moved Ella to a temporary set up in our bedroom, I thought I would take this chance to restore the nursery to its former pre-baby glory. 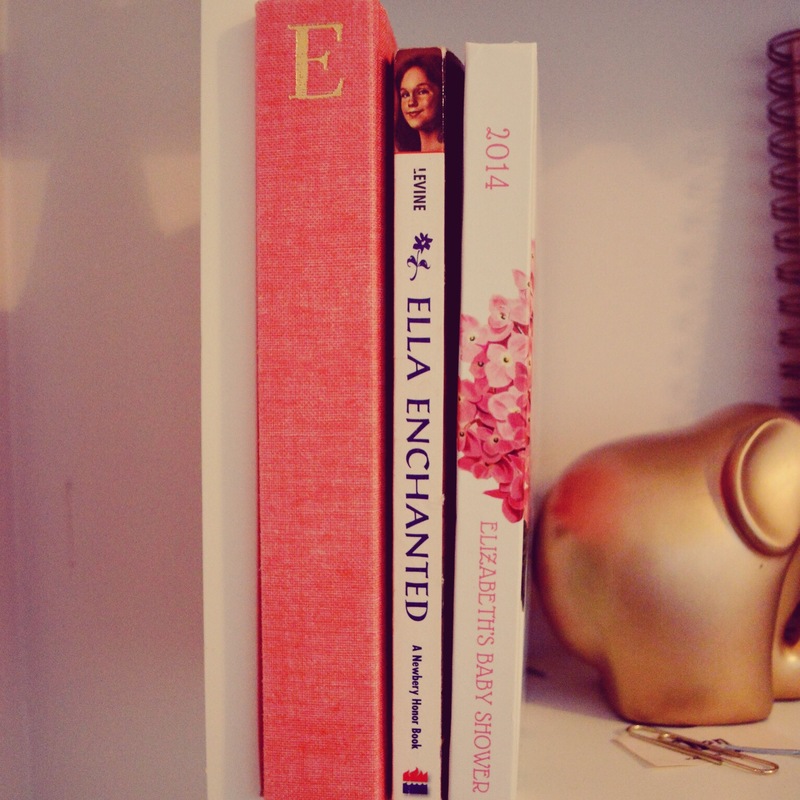 I wanted a sweet, innocent feel to Ella’s room. 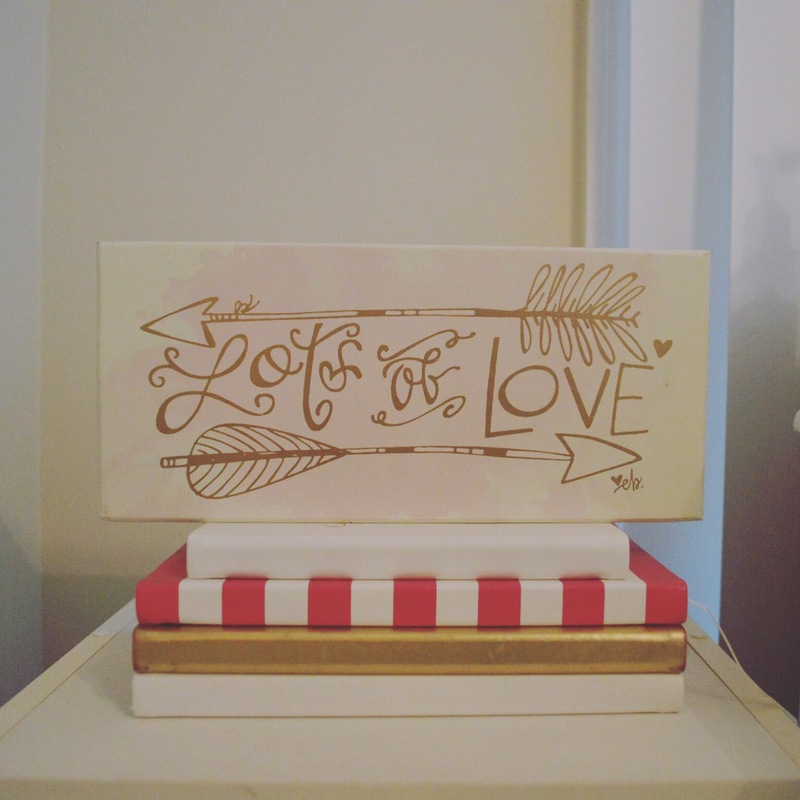 As far as colors go, I was drawn to pink, white, and gray, and gold accents. 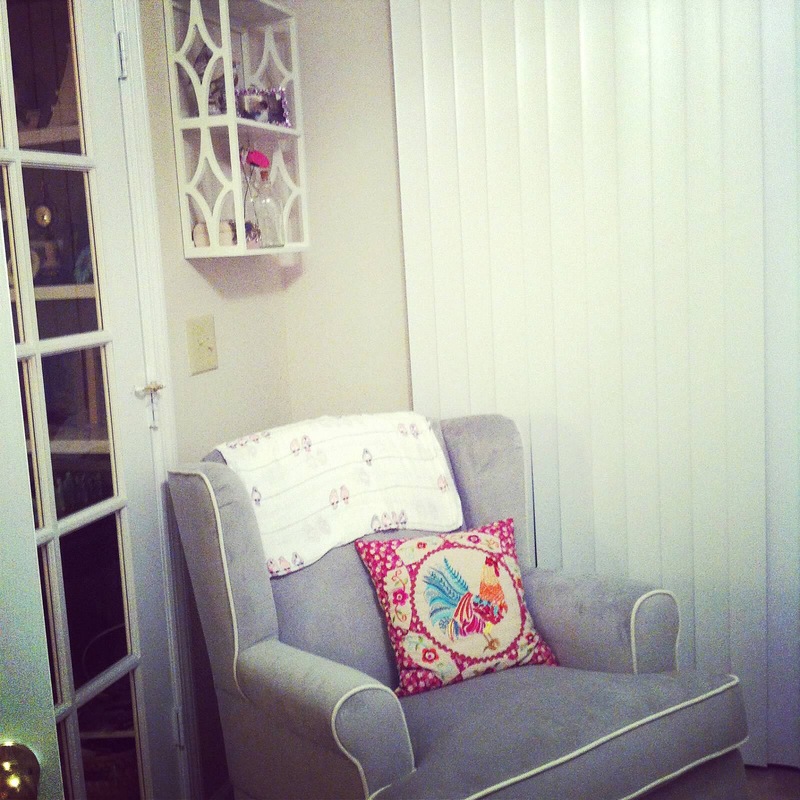 I wanted it light and airy and girly. 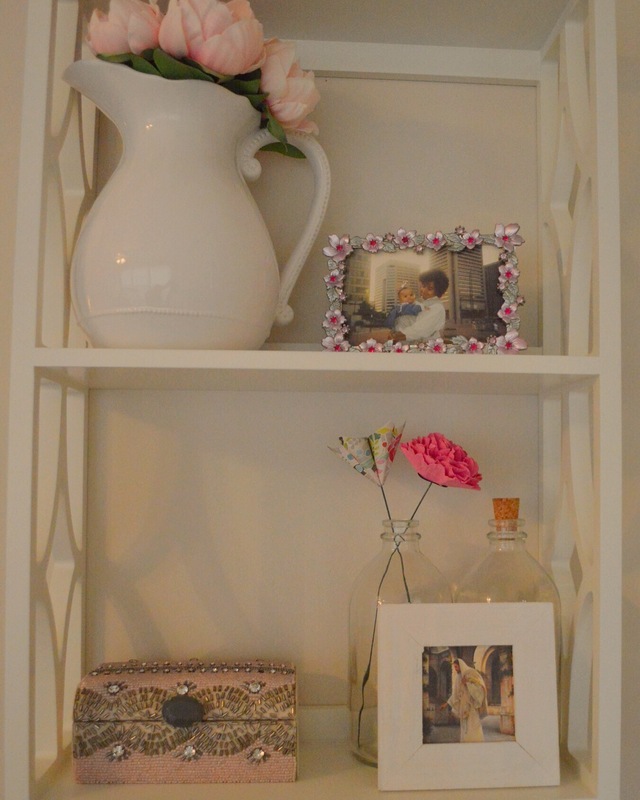 I really wanted to add sentimental touches, which is where shelving really comes in handy. Since the room is made up of mostly windows, I had limited space to display trinkets and pictures but overall, I’m really happy with how it turned out. 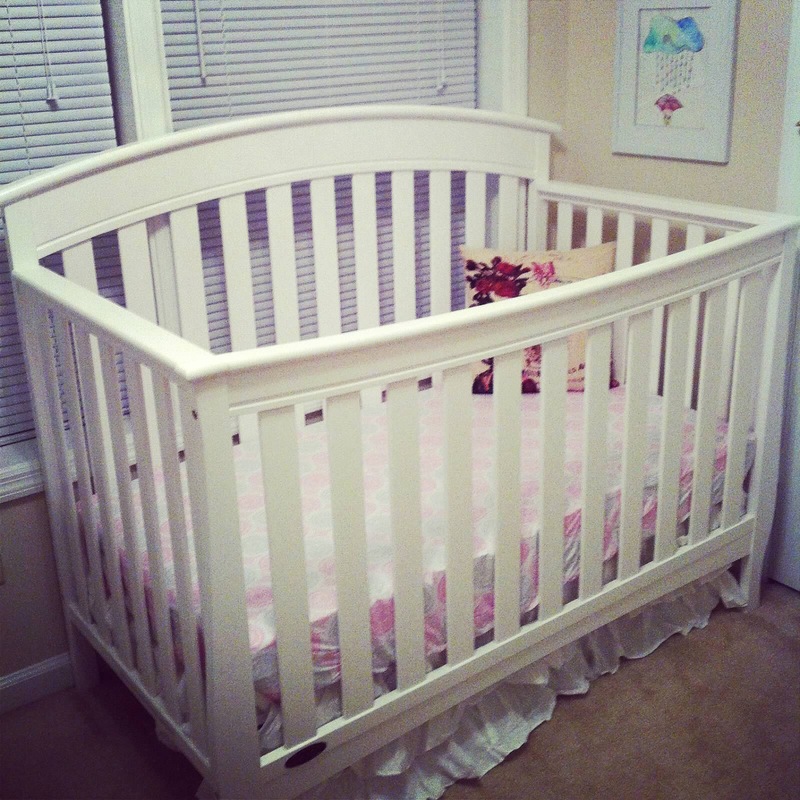 Details: I didn’t want too much done to the crib. I kept hearing bumpers weren’t safe so I didn’t bother with one. The pillow, which I’d had and loved for years but was a little too girly for the living, was just for effect. Details: The picture on the changing table is of roses in a park in France. That was a sentimental choice because we went there when I was pregnant with Ella. 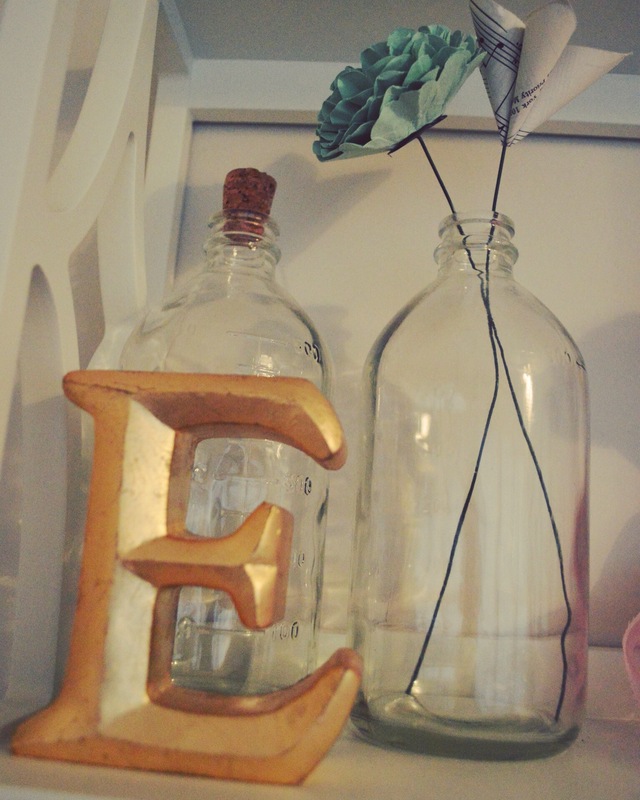 Details: The “E” hanging on her door was one of my shopping triumphs. I was pregnant but we knew we were having a girl and that we were naming her after me so any and all things “E” were welcome. I saw an “S” version of this in a HomeGoods one Saturday so I kept searching through the aisles to see if they had other letters. I came across a woman holding this “E” and I froze. Actually. This woman held my dream in her hands! 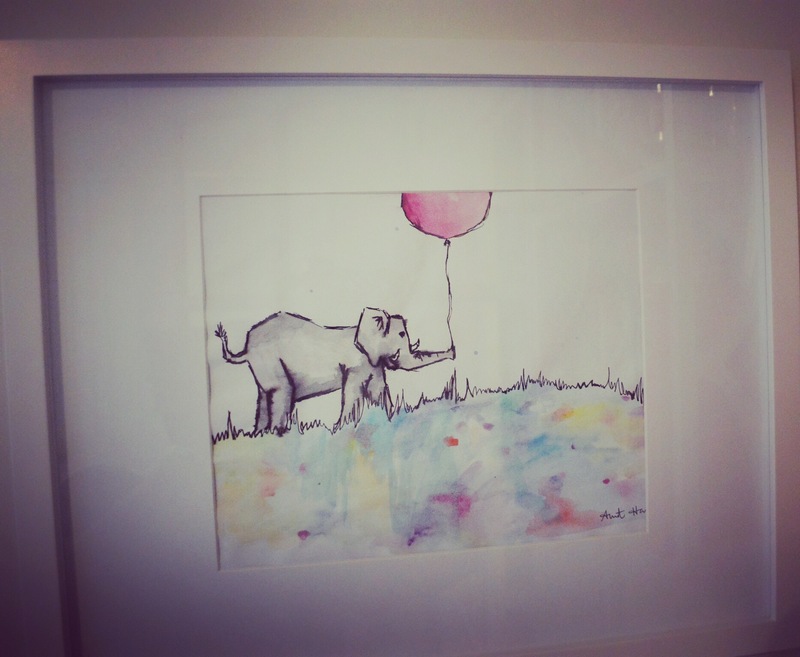 It was the perfect colors and meant for my nursery. I watched her study it but I wasn’t going to breathe down her neck because that is my pet peeve when shopping. Eventually she put it back down and I tried very hard to walk in a normal pace and pick it up. I saw why she’d put it down- it had yellow marks all over it. But it was only 10 dollars and I was sure (well, I was really really hopeful) that I could do something with it. A lot of paper towels and cleaning products later, any marks were gone or barely noticeable. Victory! Details: Another sentimental piece. This was a souvenir we’d gotten from some street market in Montmartre. 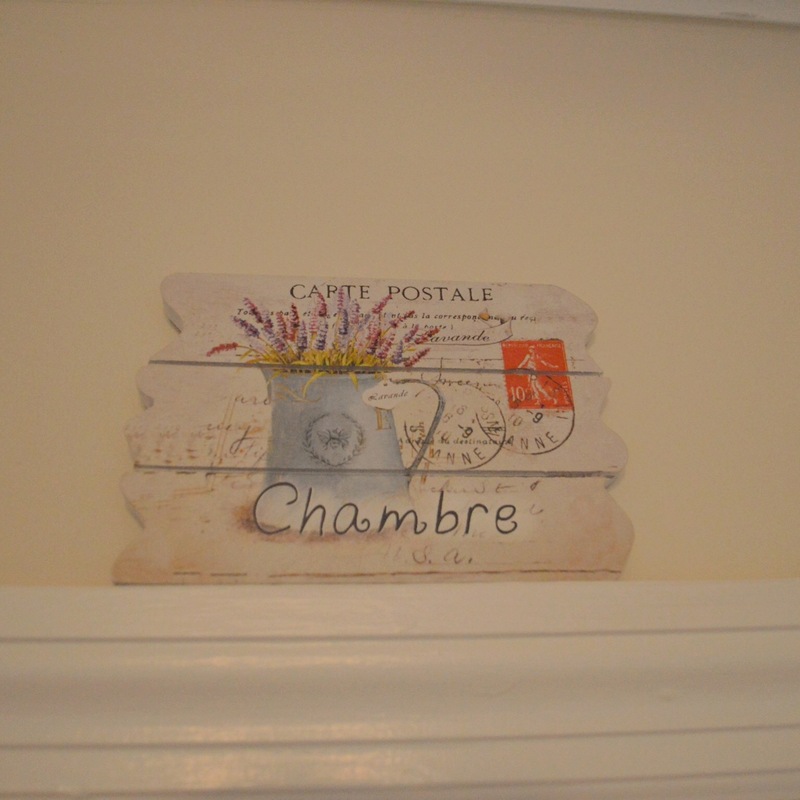 Chambre is French for bedroom, so it was perfect to hang above Ella’s door. 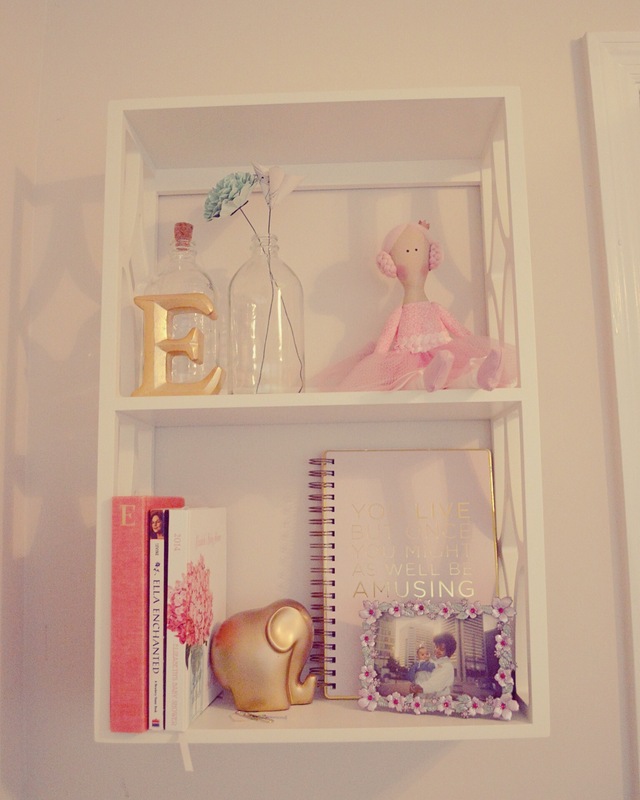 Details: My favorite aspects of Ella’s nursery! These shelves. I found them at Pottery Barn and they were another little victory in that they were on crazy sale the summer I was pregnant. Details: So many personal details. 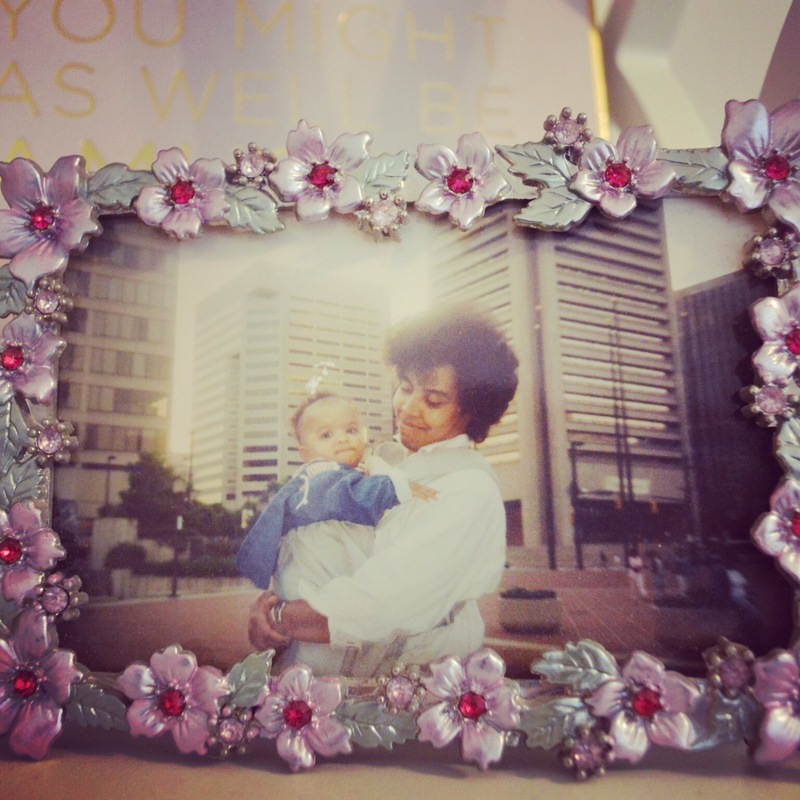 My favorite has got to be the picture of me and my mom at the Inner Harbor when I was a baby in a frame I’ve had since middle school.